Supermarket giant Tesco is trialling a new TV and film streaming service called Clubcard TV. The free on-demand service will allow the supermarket's 15 million loyalty card holders to access TV shows and films online. Tesco is currently testing the service on its own employees before rolling it out "sometime this year", a spokesman told the BBC. 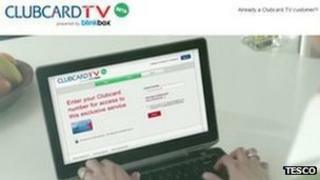 Clubcard TV will be powered by Tesco-owned online video provider Blinkbox. "We're always looking for new ways to reward our customers' loyalty," the spokesman said. "We're trialling Clubcard TV with colleagues to get their feedback before rolling it out more widely." Tesco is not revealing the nature and extent of the content it will be offering, but titles listed on the promotional webpage include Superman Brainiac Attacks, Care Bears, and Two Pints of Lager and a Packet of Crisps. Competition in the on-demand space is already fierce, with free and subscription services from Netflix, Lovefilm, Virgin Media, BT Vision, YouView, BBC iPlayer and BSkyB already fighting for customers. Jonathan Doran, analyst with researcher Ovum, said: "The market is already so crowded with on-demand services that Tesco will struggle to have any impact, especially if the service is only browser-based. "Success will all depend on the quality of the content." Is the future of all TV online?